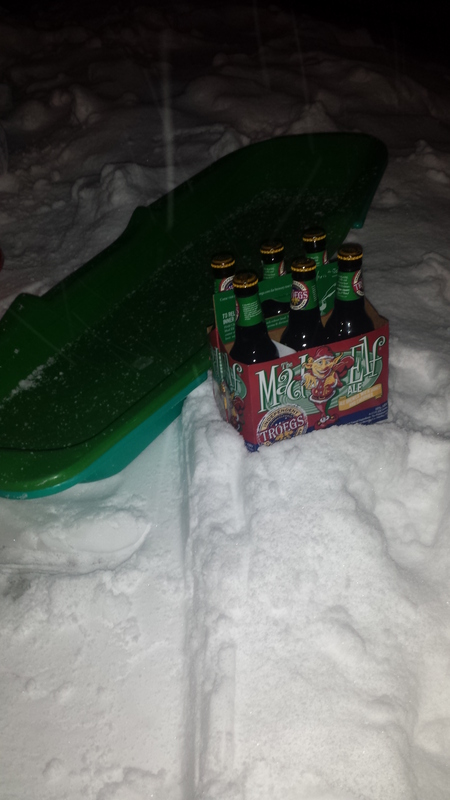 Sledding and drinking some Mad Elf over Thanksgiving-the exercise was obviously walking back up the hill. If you’ve ever read this blog before, you probably know that my perfect weekend includes a combination of some sort of quasi-athletic activity accompanied by some post activity pub crawling. You know what’s even better? When the two activities are combined, which is why I think I was drawn to the idea of pedicycles from the beginning. Your peddling, but also drinking-basically the perfect combination. This one might seem kind of obvious, but because there’s now four options for you to chose from in Pennsylvania, I thought it definitely worth mentioning. Now, our lovely PA liquor laws restrict you from imbibing on the actual bike, but you know what? That’s fine. Peddling these bad boys actually amounts to a little bit of work and I don’t know that you’d really have time to enjoy a beverage (maybe alcoholic whipped cream like this Nashville Scene reporter, although that stuff is nasty). Philadelphia has the Big Red Pedal Tour, which I’m a big fan of. NEPA has the NEPA Party Bike, while Pittsburgh has both Power Pedal Tours and the Party Pedaler. The first time I completed a bicycle pubcrawl it was disastrous, and I swore I’d never do it again. You know what the real problem here was? It was in Florida during July. Riding a bike without boozing in Florida during July is hell. Luckily, we’re much more temperate here. I participated in a Philly Bike Tours craft beer tour last year which I had a ton of fun doing. While they are not currently offering said tours, you can easily rent a bike from Fairmount Bicycles and follow the same route we did (it will just require a little more research from you to start). It was a super easy and tasty ride. Lake Country Bike on the shores of Lake Erie runs bike tours through the Northwest Pennsylvania wine country, if that’s your thing. Actually, biking any of PA wine trails or ale trails is an easy enough idea with some pre-trip planning. NEPA also has a bike inn to inn tour, which takes you down Northeast PA’s railtrails and has you staying at several local inns, all of which double as bars. One of my favorite things, that I personally don’t think I do enough, is cross country skiing bar crawls, and my current home base of NEPA is the perfect place to do that. If you have (or rent) a pair of skis, the Beacon, Candlelight, Arlo’s, and the Herrick Lodge all sit along the rail trails in a 5-6 mile range. You can read more indepth about these locales at my “Northern Tier Tour” post. A lot of the PA XC-ski locales include pubs. You can check more about these locations here. I have to say that Ice Skating on a circular rink is one of those activities I just don’t get-like I’m not sure if I’d enjoy skating around in a circle for more than 5 minutes, plus I’m awful at it. However, Philadelphia’s Penn’s Landing Winterfest Park and Beer Garden provides skaters with a nice selection of local craft beers. While technically it’s New York, this was the first year I didn’t do a Kittatiny rafting/camping trip which does involve paddling and boozing, although I don’t remember the last time I picked up a paddle on one of these outings. That being said, if you want to do more than float, the option is there. Fitzwater Station is a cool little bar in Phoenixville that you can rent kayaks and canoes right out of for a little jaunt on the historic Schuylkill Canal. Fegley Brewworks in Allentown has “Hoops and Hops“, hula hooping and drinking. I don’t know if I’d be super excited to try this, or never admit to anyone that I’ve done it-I’m still up in the air. I just recently found out that this is a thing, and while it’s hard to find an event in Pennsylvania, I wanted to include it as it’s currently the ultimate trendy blend of beer and exercise. As described on its “unofficial website”, it’s a sport that combines running and speed drinking. Essentially you run a mile around a track and after every lap you chug a 12 ounce can of beer. This is an actual competition, and while most events seem to happen in Texas and California, occasionally PA hosts races. The more I read about this, the more intense it seems (there’s televised championships, people have corporate sponsors) and the more I want to just leave it alone, which is why it’s a good place to stop for today.